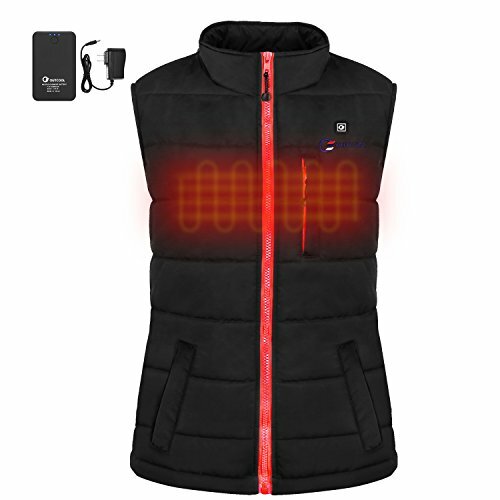 Incredibly lightweight,comfortable OUTCOOL heated vest, button with integrated heating system to keep you warm anywhere. Waterproof, breathable and resist wind. 3 Core warming zones on Left Chest, Right Chest, and Mid-Back. Press and hold the power button for 3 seconds to turn on the power. The temperature starts to rise after 10 seconds. 4 Levels Temperature Setting(Pre-Heat, Low, Medium, High). High--Red LED; About 55-65?, the battery will last approximately 3-4 hours. Medium--White LED; About 50-55?, the battery will last approximately 5-6hours. Low--Blue LED; About 42-50?, the battery will last approximately 7-8.5hours. 3.Machine wash, Gentle Cycle in warm water. Please don't use bleach, don't wring or twist, and don't dry clean. 4.Tumble Dry on low heat. Don't iron. 1.Never use if inner liner is wet. 2.Not recommended for children or persons with health conditions. 3.Heating elements are not recommended to touch bare skin. 4.Shut off power immediately if discomfort occurs. High Quality: Outer made of light weight Nylon shell Water-resistant and and Wind Resistant. Inner made of bonded fleece, breathable and wash safe. The slim fit design of the electric heated vest to ensure comfortable slim effect, is a great choice for women. Perfect for outdoor enthusiasts snowmobiling, motorcycling, camping, Hiking, Skiing, Skating or just plain walking around in cold seasons. Designed for Cold Weather: The OUTCOOL Electric Heated Winter Vest, provides heat to your body's three core areas, where you need it most. Radiant heat technology and a 7.4V portable power bank deliver consistent heating power - no matter the temperature, let you feel comfortable and warmth. Battery and Charger Included: OUTCOOL Heat Gears' radiant heating technology plugs into an internal DC5.0V/2.0A cord and is powered by a 7.4V power bank. Up to 8 hours of radiant heat in cold temperatures. It can be also used as a power supply for your phone or other devices. Temperature Control: Three carbon-fibre heat zones provide fully adjustable heating comfort, all at the touch of a button. The thermostat switch is easy to use - high, medium, and low are indicated by a colour coded LED, and a warming feature and safety shut off are built right in. Notices: Color as picture. Please consider your size when you order. Fully machine washable, just need to remove the battery power pack and ensure the built in cable is secured - with proper care, provide comfortable warmth for years.